what a “treat” – i’m certified!!!! 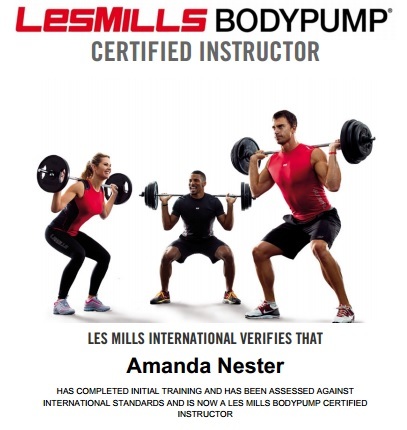 I just got an email that I passed and am certified as a LesMills BodyPump instructor!!! I only had to record my video THREE times, so I was tickled pink (or orange and black if you want to go Halloween themed) to find out. It was harder to get certified for this than my ACE Personal Training. Woo hoo! Happy Halloween! This morning, I fed the baby and got up really quietly to take a shower in hopes the babe would go back to sleep and I wouldn’t wake up the toddler. Husband was gone to work. I’m in the shower, when the bathroom door opens, then closes. I hope it’s my toddler! Finally after it opens and shuts a few times, here comes my NAKED two-year-old. Of course I ask him why he’s naked and he tells me he had an accident and his bed’s wet. Good Friday morning! Then, the second “scary” thing of the morning…I totally forgot to dress up! I mean, it didn’t even cross my mind until I got to work this morning and saw other people dressed up. I knew it was Halloween and I had intended to dress up, but I just plain forgot in the rush this morning. Today is my late grandpa Bill’s birthday. Freaky, huh? We were both smiling under our masks…then we realized it didn’t matter because you can’t see our faces! Duh! My friend and co-worker Michaela took my class this morning and we both wore masks getting started. We had to shed them in order to breathe during the workout, though. It was HARD and I’m going to be SORE tomorrow (and probably Friday, too)! If you missed it, here’s the workout from yesterday’s post. Both of us ended up taking BodyPump yesterday evening. Well, I ended up TEACHING it instead of taking it. I wasn’t planning on it, but the instructor had an emergency and I filled in. It was fun. Tomorrow will be a rest day for me, but I hope to jog and swim Friday. I did end up swimming 14 laps this morning after class – I’ve been out of the pool for two weeks, which is too long. Thought this workout looked cool so I think we’ll do it in my 6:15 am class tomorrow. I was going to do BodyPump, but this has some neat, different moves and is themed. Now, I just gotta figure out what to wear as a costume tomorrow. My son has a “green goblin” mask and I could wear it. Freaky!